What to do if my child is bored of swimming? When children reach the age 10 and up and are strong, competent swimmers we can sometimes find they can become bored of the usual swimming routine. At Mermaid Swim Academy we aim to provide children with not only the essential life skill of swimming itself, but a lifelong love of swimming both for fun and fitness. At our sister company for adult swimming – Salty Fit – we come across many adults who wish they hadn’t given up on swimming when they were younger. So how do we keep our young squad swimmers engaged and happy at swimming? Development and Advanced Development Squad – despite some swimmers feeling like they’ve ‘completed’ swimming when they can easily swim freestyle up and down the pool, there is always more to learn! We focus on continuing to develop the finer aspects of each of the strokes – in a fun way – so our swimmers can continue to become faster and stronger in the water. This also prepares them well if they do decide to move onto competitive swimming in the future. Fitness Squad – our swimmers can come to Fitness Squad in addition to their weekly development squad. This session will improve stamina and fitness and give swimmers a taste of what a competitive squad is like by introducing lane discipline and using the clock. 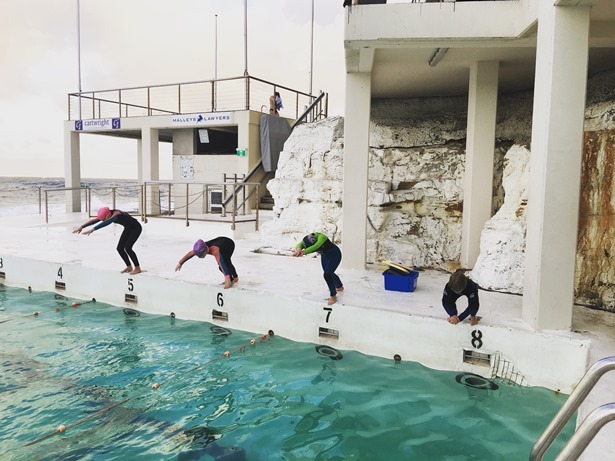 Fitness Squad swimmers also enjoy open water sessions throughout the term and learn how to navigate through the surf, how to recognise a rip or current; how to use the rips/currents to their advantage; how to body surf and how to effectively ocean swim. Race Clinics – as swim instructors we are constantly asked “Can we practice dives today?” “When can we practice tumble turns?”. Our Race Clinics we focus only on starts, turns and finishes. This is a fun session which is perfect to master these skills which we are unable to spend lots of time on during Development and Advanced Development Squad. Race Clinics are perfect preparation for swim carnivals and swimming competitions. Whatever your child’s needs or desires are, between Development Squads, Fitness Squad and Race Clinics we have something to offer them and keep them entertained and engaged in swimming. Bookings for the full season are open, with our first Race Clinics of the season coming up on October 6th.